Ever since my kids started school, I’ve become fixated on a strange American practice: the school drive-through drop off. Many parents it seems have made the choice to drive by the school, open the door and drop their kids off at the school entrance without leaving the comfort of their car. I know every one does not live walking distance from school and some parents must drive their kids to school. But is it necessary to do a drive-through drop off? Can’t they park their cars and walk their kids to the school yard? Sure it may be easier, more convenient and less hassle to do a drive-through. But what about the impact to the whole community around the school? What about the unnecessary pollution and increased traffic they are creating and the sedentary habits they’re teaching kids? I want to encourage parents to change this habit. Last year, I teamed up with a highly energetic biking couple at our school who also use bikes as transportation. Together we’re working to promote more walking and biking to school. Last year, we implemented some super successful walking and biking programs. Our Bike to School Month was a hit. A handful of parents have told me that because of our efforts, they have made a habit out of walking and biking to school. This year, we got a little more serious. We teamed up with two women from another local elementary school in Northeast Seattle who were working on the same issues at their school. We decided, combining efforts could only help our cause. In December, we applied for a Seattle DOT Safe Routes to School grant with the purpose of encouraging more people to walk and bike to school. We recently learned our two schools were awarded one of the grants. We plan use the grant money for various events to promote walking and biking to school throughout the year. Our first campaign of the year is Walk A Block. In an effort to curb the drive-through drop off habit, we’re encouraging families to park their cars at least a block from school and walk their kids to school for one week. We’re not asking for much – just one block for one week. We’re hoping to reduce the number of cars in the snaking line around the school. This will reduce the pollution directly adjacent to the school and encourage more families to leave the confines of their warm cars and walk their kids on to the school yard. We’re hoping some families will get into a habit and make it a regular practice. Maybe our next step will be to ask the neighboring Catholic school to join us? They have an even bigger problem (in my opinion). Not only do they have a line of cars that snakes around an entire city block during drop off and pick up (complete with a dedicated traffic cop to direct traffic and manage the line of cars), they have a second line of cars that snakes around the playground with a second pick up spot. Apparently they have decided it’s more important to accommodate the cars than let the kids use the playground to play after school. This entry was posted in alternative transportation, bigger than here, bikes, kids, neighborhoods, School and tagged Safe Routes to School, schools, seattle, Walk a Block. Bookmark the permalink. Absolutely beautiful idea. Good luck! I agree that many parents don’t walk and bike when they could. I know one person who does the drop off because they have a 1 year old in the other car seat, making it an affair to disconnect and reconnect everyone. This is not the majority I assume. But if we could encourage a handful of people to give it a try, who really could get out of their cars and walk if they wanted to, I’ll consider our efforts a success. A few less cars really do make a difference. I recently had an experience in picking up my wife’s nieces from school. I had to do a drive up to the school and snake around in a line of cars, an administrator walks up and ask for the kid(s) name and radios it ahead to a person with a blow horn which in turn calls for the kids. If parents can just take a little time and meet their kids at school, they could have a nice walk back home and get some exercise. I remember when I was youger than 10 and was walking to and from school. A little older and I was bike. How I wish that for my kids. I’m in complete agreement about walking/biking to school. The walk to and from school is my favorite time of day – I wouldn’t trade it for anything. I think that just giving the freedom to walk to school is also better for childrens behavior. I live to far away from school to walk, i still rode the bus, but as soon as i was in sixth grade my mom let me ride my bike to and from school as long as i was home by five. i think this made me more satisfyed and i felt less need to rebel against my parents. That’s really great! Chicago’s trying to get that safe routes to school program rolling, too. When I was a kid (and now I sound like my mother) we always walked or biked the mile to school. Kids who lived further away took the bus. Simple. The most hairy spot on my morning commute is going past a prep school because the bike lane’s always filled with SUVs pulling in and out and doors opening. Nice idea. I have a little one ( 2.5- not 1 but still small and still not a good walker) and on the days I do have to drive girlchild to school we stroller or ergo it. It isn’t fun but the drive thru drop off doesn’t make sense to me at all. Whenever I pass by I see a line of idling live parked cars. Either you get there early and sit- or you get late and circle round until you can get in line. I get it. I live in Boston where it’s been 15 degrees and a wintery wonderland but our “blue zone” is a big “no zone” in my opinion. Maybe I’ll try a walk a block campainge too. What I never understood was in the school district I went to there was a rule that buses would not provide transportation to students living less then 2 miles away from the school. 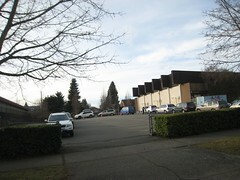 Our schools were in mainly the “good” parts of town, surrounded by historic homes. Instead of letting their children/teens walk to school most of the kids living in these neighborhoods had their parents drive them the few miles to school and home again. I thought this was pretty crazy, even when I was in middle school, long before I ever considered myself an environmentalist. If I missed the bus my mom wouldn’t drive me the few miles to school and I had to walk. It seemed to me there was a social stigma attached to walking to school or riding a bike. I had plenty of parents stop on the way home to offer me a ride in horror that I would actually have to walk to or from school. I even had people insist on giving me rides home when I was only a few blocks away from my neighborhood. I appreciated the rides especially when I got into high school and was carrying around a library worth of books, but never really got why everyone felt bad that I had to walk home sometimes. It wasn’t even like I was walking home in 10 feet of snow or anything, just typical 60 degree weather. So many of the above comments ring true for our local schools…the lines of idling cars, the parents unwilling to park and walk. It’s a complete bummer! The overwhelming majority (80%? 85%) of students who go to my son’s school live within a 2 mile radius — through very walkable/bikeable neighborhoods…and we live in Florida, where climate isn’t the concern it is for lots of other cities. But do folks walk? Hardly. Do other parents take their kids to school on bikes? Not really. In a school of 300 kids, only three are dedicated cyclists (riding their own bikes to school). And there’s two other families who walk their kids…and me, who shuttles my youngster to and fro on the back of an Xtracycle. The more I think about the silliness of it all, the more my head hurts! And even in discussions with the principals, they’re just not interested in pursuing reasonable, environmentally-friendly alternatives to the “car snake”. Vanessa – I’m impressed! Sometimes it is inconvenient/more difficult to bundle up the kids and walk. But I’m with you, it’s just the right thing to do. Maybe you’ll rub off on some people in Boston. Ghost Rider – We met our principal at the beginning of the school year and she was not at all on board with promoting biking. She was very focused on making things easier for the cars but didn’t see biking and walking as part of the solution. She’s come around and now supports and encourages our efforts. My son and I have been biking to Laurelhurst all year. We get on the bike trail at 25th NE, ride together until we hit the wooden bridge, and then split up. He’s got to cross Sand Point and walk up that big hill on 45th that goes by Children’s Hospital. Does anybody know a route to Laurelhurst from the Burke-Gilman trail that doesn’t have the killer hills? Good for you for biking to Laurelhurst! They are our partners, have a very organized bike to school effort. When I go to Laurelhurst and don’t want to ride up the hill, I take the trail to 40th Ave NE – take a R on 40th, take a R on 55th Ave NE, a R on Princeton Ave NE, a R on to Sand Point, then take the first left 47th Ave NE. No hill, but sort of roundabout so it’s debatable whether it’s faster. I’m not sure I’d send a kid that way alone (unless you tell him to cross Sand Point at the light and hop on the sidewalk for that half block by City People’s and Great Harvest). Cars treat Sand Point like a freeway and you have to cross all lanes to take that first L, can be pretty hairy. I think you may find this amusing. Perhaps, stomach churning as well. It’s an article that appeared about a year ago in the New York Times. For non-New Yorkers, the Upper East Side is where people like hedge fund managers and other Wall Street types (the people who killed your 401k) live and the Y’s nursery school is their hallowed ground. Thanks for the link. I remember reading that article last year. If my memory wasn’t so bad, I would have linked to it in this post. It’s perfect! 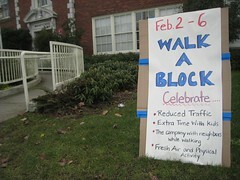 Sounds like administrators have introduced their own walk a block campaign. But instead of offering prizes to kids to encourage participation, they’re issuing the threats that those kind of people care about. Funny. Using the playground for a parking lot. Truly we’ve come a long way in the wrong direction.